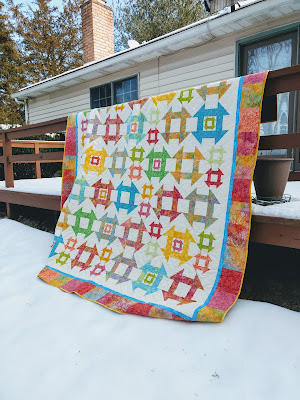 I am so excited to share my quilt for the Getaway Blog Hop, hosted by Island Batik! This collection has a tropical feel! I love that many of the prints have orange featured! I used ten slightly larger scale prints (and the rainbow batiks) for the larger church dash blocks, and used six smaller scale prints for the medium and small churn dash blocks. I used an oatmeal blender for my background fabric. Once the quilt center was assembled. I used a turquoise blender batik for the small border. 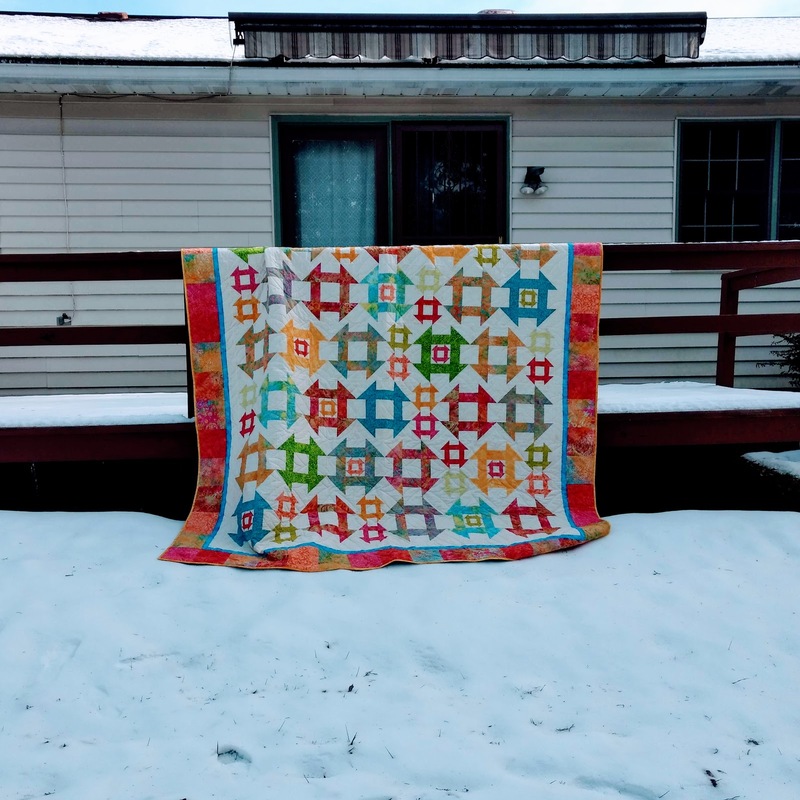 Instead of using wide strips for the outermost border, I used squares of the various pink, orange, and rainbow prints to finish the quilt. 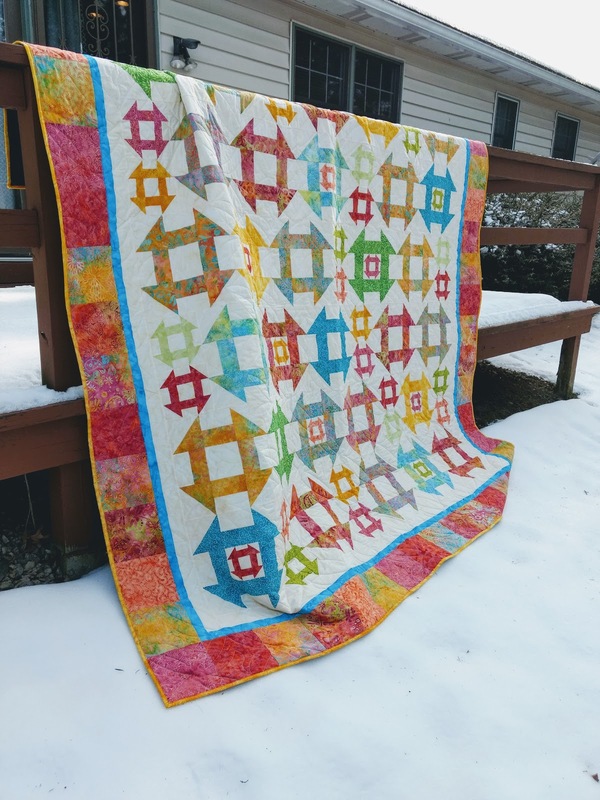 The quilt was long arm quilted by Fran of Twin Stitches using a pantograph called "Dazzle." I used three different yellow fabrics from the collection for the binding. I love how this quilt sparkles with these Island Batiks! The cold and snow impeded some of my plans for pictures, but I was able to snap a few once the sun came out today! Now for a little giveaway! 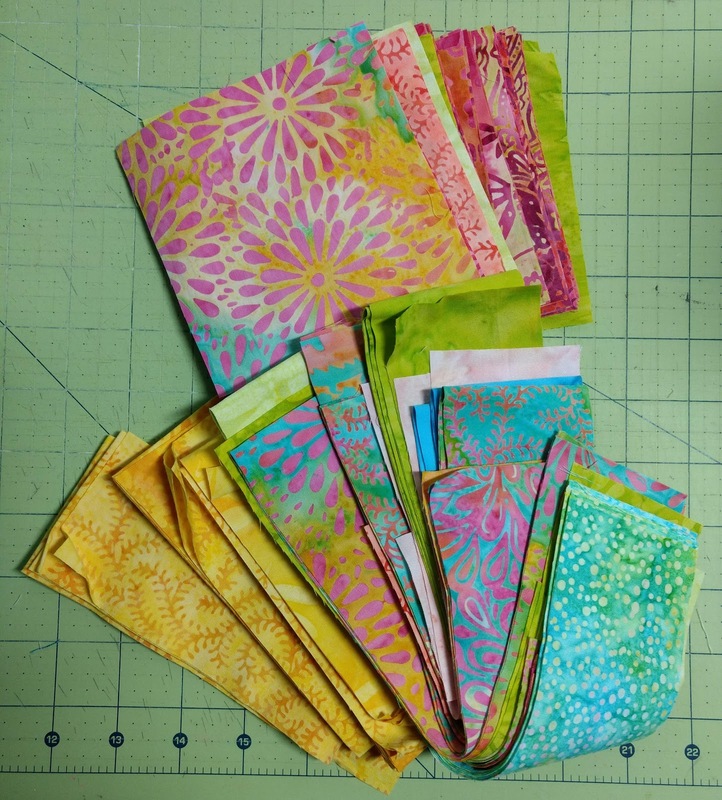 Don't forget to enter Island Batik's fat quarter bundle giveaway too! 1. Tell me which of the Bazaar prints is your favorite. My favorite is the teal scroll. 2. If you follow me in some form or fashion (blog, FB, IG, bloglovin, etc.) tell me how you follow in a second comment. 3. Leave a final comment if you've visited any of the other blog posts from the Getaway blog hop and tell me whose blog you visited. You can see the full schedule here. Update 2/4/19: Joyce is our winner! Thanks for visiting Little Bunny Quilts! Sharing at Linky Tuesday, Needle and Thread Thursday, and Let's Bee Social, too! And of course Brag About Your Beauties! 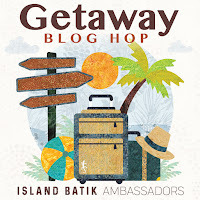 I have visited each of the hosts every day of the Blog hop so far, yours is the last stop of my morning with the Island Batik Blog hop. I will be back again tomorrow! Moroccan Bazaar is my favorite of the Bazaar fabrics! It is so full of color! Beautiful quilt, Alison! I see you are a fan of Churn Dash blocks, too! Just a tiny little difference from my quilt yesterday. ;) Love the colors, though. Alison, the quilt is just lovely and the fabrics do indeed sparkle in it. 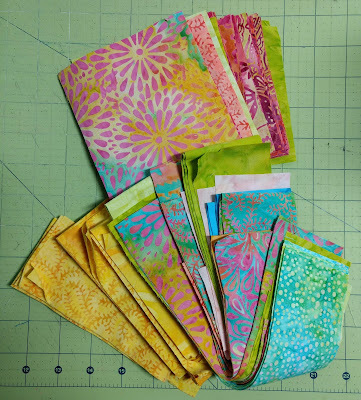 Ditto, I love your Churn Dash pattern in these bright pretty batiks. Alison, your quilt is very beautiful. The Churn Dash is one of my favorite patterns and these fabrics are so gorgeous used in this way. My favorite from this collection is Paisley Drops. Thank you for the chance. I have visited all of the blogs that have showed their projects so far in this Blog Hop. 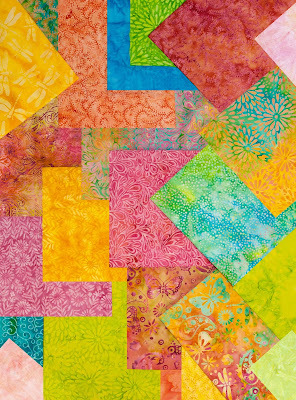 Beautiful quilt Alison and love the colors in the batiks! I like the yellow fabrics as they would brighten my room in dreary winter here in Michigan. One of my favorite block patterns, also. I love the blue fabric, but they are all beautiful. I have visited all the bloggers so far. I love the various size churn dash and they way you separated them so they would be shown so appropriately. Those pieced borders are so much fun, too. Alison, moracan bazaar is by far my favorite. These prints are lovely. How do I choose just one? lol I really love the pinks and the teals. I especially like the medium green flowers. I have visited all the blogs so far. Great eye candy. What pretty fabrics! I like the pink floral at the top of the stack on the top. Flamingo Paisley! I'm a sucker for paisley prints and Flamingo is just a fabulous name for a color. I have visited all on the list so far, according to date. I follow you on Bloglovin'. Looking forward to your Mystery QAL next month! I am almost sure I follow you on all media listed. I have your original blog-hop list (from Jan 7th) open in a tab that I refer back to every morning to see all the new posts! So many beautiful fabrics and quilts. Love the bronze/blue green. Gorgeous fabric ! What an fabulous design for these beautiful fabrics. Churn dash on point...Love it! These prints are lovely. I really love the pinks and the teals. Your quilt is gorgeous. thanks for sharing. These are great fabrics - I particularly like the teals, in combination with other colors. I follow you on Blog-lovin. My favorite of these bazaar batiks is the multi-color with dragonflies and butterflies. I’ve visited all the Getaway posts so far. Love seeing the projects with these beautiful fabrics. I especially liked the one in the library by If These Threads Could Talk. I love the teal with the dots!! Your quilt is beautiful! So far I have visited every blog on the hop except Den syende himmel and I'm heading there next!! The teal is my favorite also. I have visited nearly all the blogs so far. I like the green print with the flower bursts. Not sure if that's the technical term for it! I have visited lots of the blogs, maybe even all of them. I really enjoy seeing all these beautiful batik fabrics and projects. I like that hot pink floral...and your quilt! I visited all...but love the improv of Carol Lyles Shaw. My favorite print is the pink and teal shown in your picture with the strips of fabrics. I have visited all of the bloggers on this hop to date. What a colorful beauty! I visit all of the blogs to see all the ambassadors creations. So inspiring. The teal is my favorite. I follow your blog via Bloglovin and follow on IG. Butterfly Paisley in the color: Tourmaline is my favorite print in the Bazaar Collection! I have visited all the blog posts so far! Such beautiful quilts of gorgeous batik fabric! I'm really loving the hot pink floral. I love this collection! So bright and cheery. And your quilt turned out great! I have visited almost all the blogs. Everyone has done a great job! the fabric that I loved the most is the yellow batik with the dragonflies. you did a beautiful design with all those cheery prints. So far I am up to date with each of the posts in this blog hop. I missed not having any on the weekends so I was glad that Monday started a new week of posts. What a lovely quilt to display these colours at their best Alison. And how they really shine against the frozen backdrop. Beautiful pics! I’m loving the teal as well! Beautiful coloursin this collection, so bright and cheery. I follow via a Bloglovin. I’ve been following this blog hop faithfully every day. I love LOVE this quilt! I like brights, but these seemed a little bolder than my taste. However, after seeing them together in a quilt, I absolutely love them! My favorite is the Mum print, the one with the pink flowers over the multicolored background. I have been following the blog hop since the start and have visited all of the blogs so far. I love those green and yellow butterflies and dragonflies. I love the multi colored with the pink sunburst on it. Beautiful quilt. I've visited all the ambassadors so far. I especially love Living Water Quilter's Butter Rum quilt, the rail fence quilt by Gateway Quilts & Stuff, and Quilt in a not-Shell's use of churn dash blocks with Winter Park. 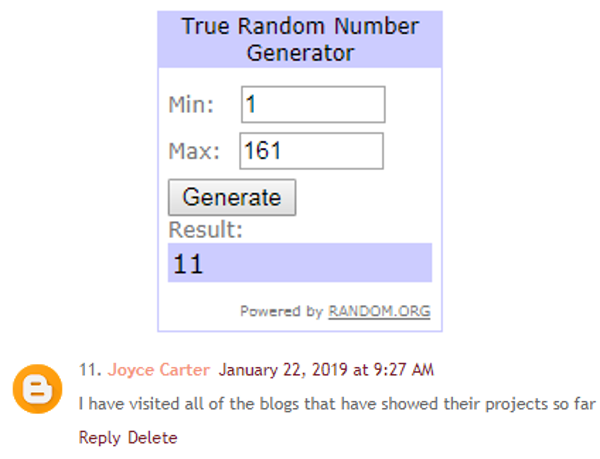 So far, i have visited everyone's blog for this blog hop. The pink flowers are my favorite! Beth @ Words & Stitches. Oh, and I follow on Bloglovin! I love the flower print that is like a mum! Beautiful quilt! I have visited all the blogs so far on the hop! Its been so much fun to see all the works of everyone. I have been on top of the hole blog hop...I love the out doors batiks. .. Your quilt is beautiful; so bright and cheery! The very bottom turquoise strip and about 5 strips up there's a pink one peeking out. Those two are my favorite. Looking forward to following your blog. I just signed up to follow you on email. Next time I'm on Facebook, I'll follow you there as well. Looking forward to it! I'm checking out everyone on the list! Down to and through yours so far. This is my first blog hop and it's really interesting. Can't wait to see all the rest of the wonderful ideas you all have shared. Your quilt is beautiful! I love all of the fabrics in this collection, but if I had to pick one it would be the daisy print in aqua and yellow. I’ve just visited with Quilt Rambler and I loved her quilts. Beautiful pattern and fabrics. Hard to pick just one. But the daisy print is pretty. Oh wow! What a beautiful and ambitious quilt! This will look stunning on a bed. Thanks for sharing it. My favorite print in this line is that beautiful limey green. I follow you on Bloglovin Alison. Thanks for all the beautiful things that you share! I have visited all the bloggers so far. I love batiks and it's so much fun to see everyone's creations! I love the quilt. I need to buy that pattern. Churn dash is a great block. I follow on Bloglovin. Forgot to add I love the teal as well but the lime green is great too. So far I have visited all the bloggers and I follow all of them on Bloglovin. Nice everyone got an Accuquilt. Makes cutting easier I bet. Great quilt and pattern. The fabrics really sing, and I love that you used the squares as border. My favorite Bazaar design is Mum in Apricot, although it wasn't a slam dunk choice as there are so many pretty prints. I follow you via email (wordygirl at earthlink dot net). I have visited each blog so far. I love seeing the different quilts and reading the varying interpretations on the theme. I follow all of the blogs each day. Really enjoy readying them. I like the teal scroll fabric the best. It is fabulous... great job! The colours do sparkle! I popped over here from Turid's blog! I love your quilt done in the batiks. SO beautiful. I am going now to check out all the other blogs. I love doing this. Also, my fav so far is the teal.. yay! The teal scroll is also my favorite. Your quilt is lovely. I've visited all of the blogs to date (or will have after I check out two more). thank you for the chance to win some beautiful batiks. They are all beautiful but my favorite is the gold. I visited all the blog posts on this blog hop up until yours. I just have three left to visit after yours to get caught up. Gosh what a lovely collection! Your quilt is fabulous. Beautiful quilt! I’d love to win this bundle! The blue and green print with the speckles would fit right into the project I'm about to start. I'll have to look for it. Ha, ha, it's going to be churn dashes. GMTA, I guess. I saw Steph Jacobson's on IG and saw Sandra Walker's cute luggage on her blog. Y'all a creative bunch. Your quilt is beautiful. Love the shots against a snowy background. Beautiful! Love all the churn dashes and all the fabrics showcased! Great photos too! I am visiting all of the blog posts each day. I love all of the bright colors in the Bazaar collection. My eye is always drawn to the bright blue in the quilts. Your quilt is lovely with all the bright colors. I really like the butterfly prints in this collection. 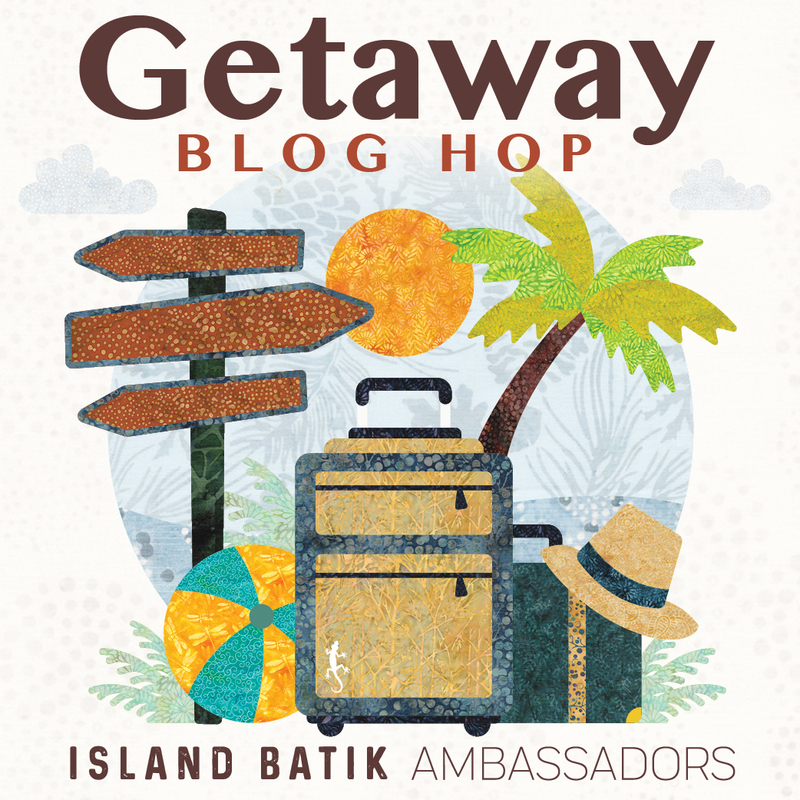 I am visiting all the Island Batik Ambassador pages. I am enjoying seeing what everyone has created with the batiks (my favorite fabric to use for quilting). I recently visited Yellow Cat Quilt Designs. I follow you on Instagram (@songbird_designs). So far I have visited ALL of the blogs. Making my rounds from last week as I missed those. But will get to them today! Thanks for the opportunity to win! In truth, I am not a churn-dash enthusiast. I don't know what it is, but churn dashes bug me. Your design, though, gives new life to the boring old churn dash! I could have some serious fun playing with value and color in that quilt design. What a great finish! The pink paisley is especially pretty.